In the weeks ahead, I’ll be sharing fashion inspired by the four Ilvermorny houses. This week, I’ll be focusing on the Thunderbird house, which represents the soul. To be frank, pretty much all we know about Thunderbird is that the house is meant to represent the soul, with a tendency to favor adventurers. We also know that the house mascot is a magical beast that can create storms as it flies. How awesome is that?? Students who identify with Thunderbird are therefore likely to be daring and spirited, with a passion for nature and a bit of a wild side. I’ve translated these personality traits into a style aesthetic rooted in bohemian elements, incorporating the “modern boho” look popularized by events such as Coachella and celebrities such as Vanessa Hudgens. For this outfit, I took inspiration from the mascot of the Thunderbird house- the Thunderbird itself. This legendary creature is rooted in Native American culture, and although its specific characteristics vary slightly with variations in different regions’ mythology, all versions of the story agree that the Thunderbird has great power over the weather (specifically rain and storms). For this look, be inspired by the Thunderbird’s ability to create storms as it flies with a loose-fit heather gray dress paired with dark floral rain boots. I also love these edgy, sleek cat-eye sunglasses – the pattern around the edges is actually a flock of gold birds, which is another excellent subtle nod to the creature itself. Finally, accessorize with a delicate gold pendant and a gorgeous rose flower crown to give you that boho flower-child look to represent the Thunderbird house’s affinity for nature and the soul. 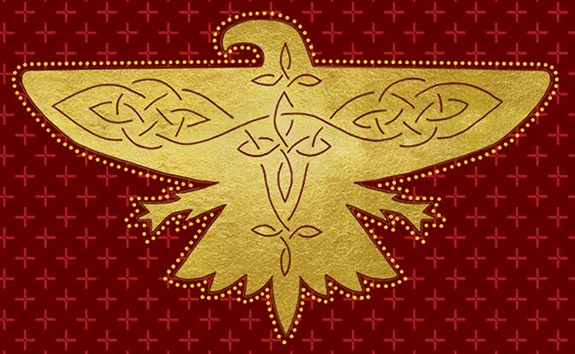 Ilvermorny as a whole is said to represent all components of the body coming together to work as one, with Thunderbird representing the soul of that body. This can be translated into an aesthetic that is very flowy, natural, and bohemian, as I’ve constructed here. “Bohemian” tends to come with an association with 1960s-style clothing (or “hippie-chic”), but a more modern and less costume-y approach can be achieved with a flowy white dress in a subtle floral print and metallic rose gold wedge sandals. I also love this on-trend gold leaf headband because it adds a pop of visual interest to the back of your outfit, while this crystal necklace will add a mystical element to the look. Finally, throw on a tan bag with stud and fringe details, and you’re all set! One of the major differences between Ilvermorny and Hogwarts is that students at Ilvermorny have a small degree of personal choice when it comes to house assignment. The mascot for each house will indicate if they feel that a prospective student belongs in that respective house, but if more than one house chooses a student, the student has the ability to choose. 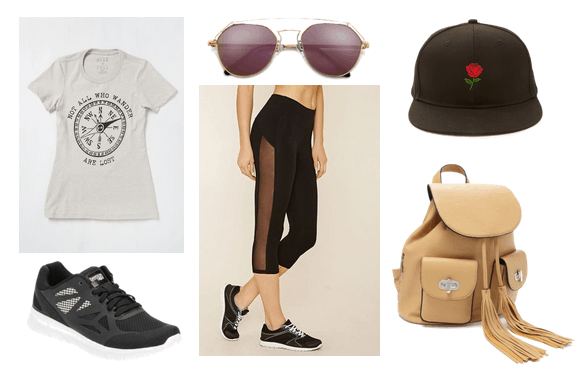 The Thunderbird house is said to favor students who seek adventure, so if you think that might apply to you, get ready for your next adventure with monochromatic running shoes and sleek black leggings with a cutout panel. The leggings will offer great range of movement for any type of hiking/rock climbing/rappelling/other outdoor activity. This t-shirt is also casual enough for adventuring, and depicts the super-relevant quote “Not all those who wander are lost”. Accessorize with items that reflect that bohemian aesthetic present in the previous outfits, such as a taupe backpack with subtle fringe detailing, a black cap with a cute rose patch, and these gorgeous emerald glasses in an interesting geometric shape. And there you have it! Do you identify with House Thunderbird? Which house should I cover next? Let me know in the comments!